About two weeks ago I had an unexpected opportunity to see In Order to Survive perform at Shapeshifter Lab in Brooklyn. 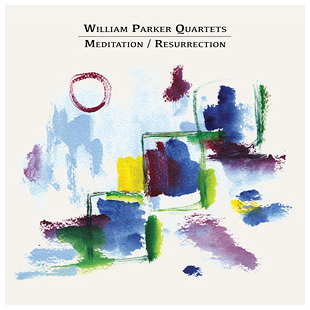 The concert was a celebration of bassist and band leader William Parker's new double album just released on AUM Fidelity, featuring the formidable quartet of pianist Cooper-Moore, bassist and leader Parker, drummer Hamid Drake, and saxophonist Rob Brown. I write 'unexpected' not because I had not know about the gig, but rather a prior engagement was rained-out only an hour before the show, and so I boogied over to Brooklyn just in time! In Order to Survive: Cooper-Moore (p), William Parker (b), Hamid Drake (d), Rob Brown (s) Shapeshifter Lab, Brooklyn, NY. July 2017. I'm feeling compelled to mention this show, not so much as a review, but as a way to just give my thanks for such incredible music. The two sets that I took in were more than a sum of their parts, and of course any chance to hear the dynamic duo of Parker and Drake is not to be missed. The effortless interconnectedness that they share invites the listener into the inner circle; however, Cooper-Moore and Rob Brown, are, to my ears, under-known legends in their own right. Cooper-Moore's piano playing was at turns introspective and unhinged, he was as apt to drop an elbow onto the keyboard as he was to turn out an exquisitely beautiful phrase. Brown is a master of building his playing up to daunting peaks, always direct and forthright, his musical instincts are a great compliment to Parker, Drake, and Cooper-Moore. Both sets that night were excellent, and since I am writing this in retrospect without any field-notes, I simply recall the first set being more straightforward improvisation working off the sketches by Parker, and the second set being an inward journey with a long arc building to an exhilarating peak. I'm fairly confident no-one from crowd left dissatisfied - and I'm sure more than one picked up Meditation/Resurrection as they left. Speaking of Meditation/Resurrection, I had not been able to give the CDs a good listen before the show. So, it was afterwards that I finally pulled out the CDs and sat down with it. The first thing to note is that the first CD is not with Cooper-Moore, but rather has the two horn front-line of trumpeter Jalalu-Kalvert Nelson and Brown. This line up has a slightly leaner sound, and the opening track "Criminals in the White House" features the trumpeter's sharp and eviscerating lines front and center. Later, during the track "Handsome Lake", the listener really gets the sense of what reviewer David Menestres meant when he wrote that Parker's compositions "feature deceptively simple melodies and rhythmic hooks that provide launching pads for creative solos." Brown's fitfully abstract and blues drenched solo over Parker's solid groove is nearly worth the purchase alone. Parker's own fractalized solo leads back to the hard-bop head, kind of leaving you with a bit of musical whiplash. Another outstanding moment on the CD happens on 'Horace SIlver part I', Nelson and the ever inventive Drake deliver a passage that more than hints at the viability of duo album. The "In Order to Survive" CD, like the aforementioned show, is something to behold. The opening moments are the meditative ones, sort of. Cooper-Moore lightly rocks backs and forth on a chord structure reminiscent of a mid-period Coltrane/Tyner collaboration on "Sunrise in East Harlem" and Parker plays at the edge of consonance. The tension that arises from it is almost to much to bear. Enter Brown and the energy shifts, Cooper-Moore expands his fills, Drake adds a little more drive, and Parker and Brown engage in a melodic/textural interplay that is a sweet and sour layer upon the modal cake. The second track, "Some Lake Oliver", is already a sharp contrast to the previous track. In the early moments, maybe three minutes into its nearly 12 (all of the tracks are at least 11 minutes), the pulse is mid-tempo but Brown is in the stratosphere, jumping intervals and assembling musical twigs and branches into a structure ready for Cooper-Moore's melodic ornaments. They reach a level here that reminds me of the show - Brown's musical id is unleashed, Drake and Parker lock down the rhythms, and Cooper-Moore is at once percussive and melodic, pushing the intensity ever higher. Parker's liner notes are pretty extensive, he includes meditations on the meaning of music, poetry that accompanies two of the song titles (there is no vocals on the discs, just in the liners), and his appreciation for the musicians who appear on the two discs. Stealing some of his words, "when music works on a high level it doesn't age. It is neither old nor new, it is Now! Living in the moment, it becomes the thing we need to revive us." I didn't mean to write this much, I simply put the album on and this came out. Thank you Mr. Parker! Agree about Rob Brown. Cooper-Moore has been celebrated recently, and Brown deserves the same. A terrific musician. Great write-up by the way, full of insight. Hi, very true about Cooper-Moore, especially with the Vision Festival recognition, but even more doesn't hurt! These shows were being recorded, hopefully they will be released at some point. I was there for the 2/13 sets and I found the performances excellent with the second set reaching extraordinary levels. Your description of Rob Brown is spot on. He's and egoless player who is able to lay out for longer periods of time than most saxophonists. When he plays he build strong structures with a firm somewhat hard tone that surprisingly stays inviting which is not always the case for these ears with an alto saxophone. I also found that my ears took time to *hear* Cooper-Moore. He exploded the universe in the second set. During a couple of the improvisational sequences he played stuff on the piano that I'd never heard him or anyone play. I left thoroughly elevated by the 2 sets. Maybe as strong as the 2012 Vision Fest set (found on WP's Wood Flute Songs).